Do You Remember Frederic Heath? Milwaukee Socialists were multitalented and interesting people. They were very well-read, knowledgeable, and studied history because if you understood the mistakes of the past you could better avoid them in the future. Frederic Heath was one of these people in Milwaukee who was a leader and teacher and generally talented man. He was very involved in the Socialist movement of the turn of the century. The Wikipedia article explains many of his accomplishments. He wrote tremendously for the Milwaukee Leader newspaper, including this series from 1920 about short topics of Milwaukee history, called “Do You Remember?” He researched and wrote these daily. As I looked through a month’s worth of microfilmed newspaper, it was amazing to find all these little detailed nuggets of Milwaukee history that he uncovered. 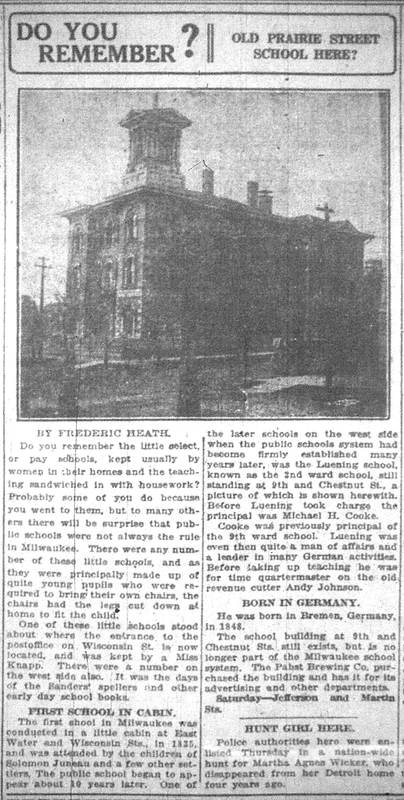 The following article about the Prairie Street school which still exists as the Best Place in the Pabst City complex was published in the Milwaukee Leader of April 9, 1920. The lecture will take place 7 p.m. Tuesday, April 30 University of Wisconsin-Milwaukee, Student Union, 2200 E. Kenwood Blvd., Wisconsin Room, Second Floor. This event is co-sponsored by the UWM Department of History and the Milwaukee Historical Society. The late 1950s was a time of fear far beyond what we experienced post 9/11 and still today. The Cold War and nuclear armageddon hysteria was reaching its climax all across the country. The Civil Defense Administration spent untold billions building fallout shelters and mobilizing local governments for evacuation plans. 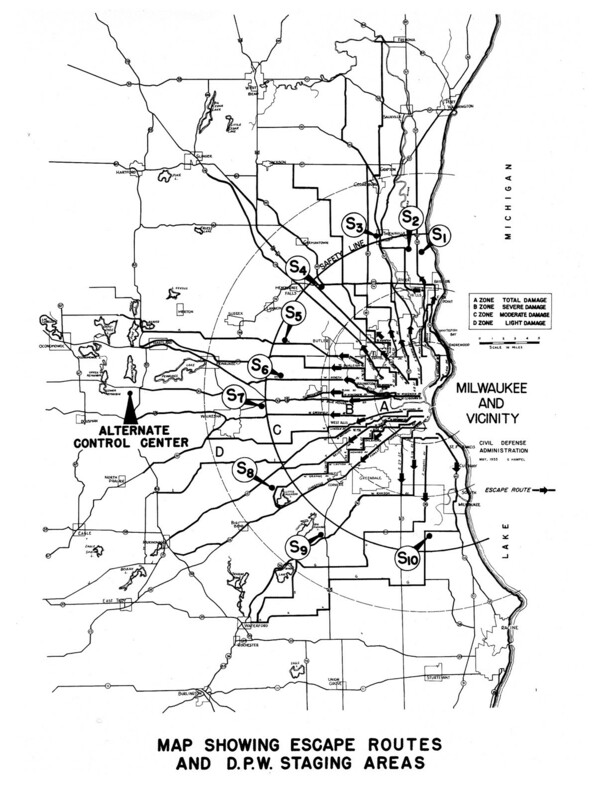 Milwaukee, as an industrial center was a potential target of Soviet long range bombers and later ICBMs. On July 20, 1956, the first of many large scale civil defense exercises was planned across the entire country. Two nuclear bombs, each with the equivalent of 100,000 tons of TNT were “dropped” on Milwaukee in the simulation. Evacuation plans had already been drawn up the previous year as shown in the map below. The day of the simulation at 2:10pm, Conelrad (Civil Defense Radio Network) halted all radio and television broadcasts to explain the exercise to citizens. The emergency government of Milwaukee including Mayor Ziedler had evacuated to St. John’s Academy in Delafield. The exercise was meant to acquaint civil and military leaders as well as the public with the realities of survival from a nuclear war. Approximately 180,000 people were anticipated to die in the Milwaukee area from the bombs. The result of the simulation was a large push for building more public and personal fallout shelters and stockpiling them for survival in the aftermath. Evacuation plans were solidified and signs were placed along the routes to clearly mark where people were meant to escape. Even before this in the early 1950s, schools had naive educational programs to teach their students survival, including “Duck and Cover”. The Neenah Historical Society will begin an exhibition on May 1st about personal fallout shelters and plans for surviving nuclear holocaust. 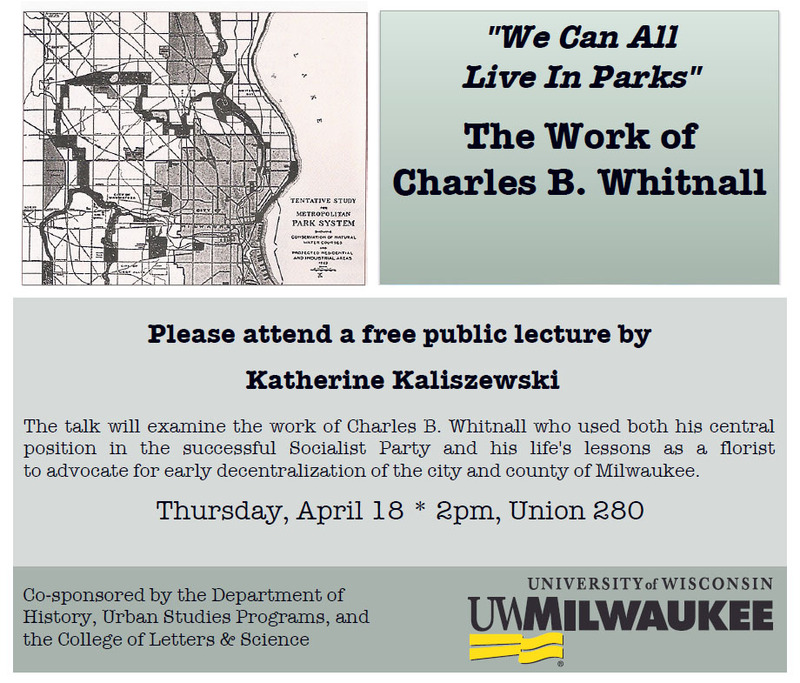 Historian Katherine Kaliszewski will be giving a lecture on the subject of her thesis, Charles B. Whitnall at the UWM Union this Thursday, April 18th at 2pm. 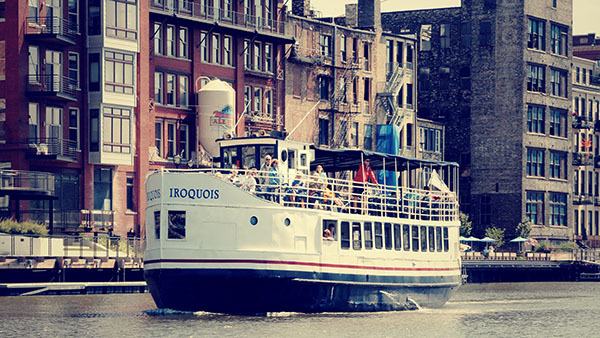 Stop by and learn some insight about the father of Milwaukee’s park system. The UWM Digital Archives started a new blog earlier this year showcasing their collections and giving behind the scenes look at their work. 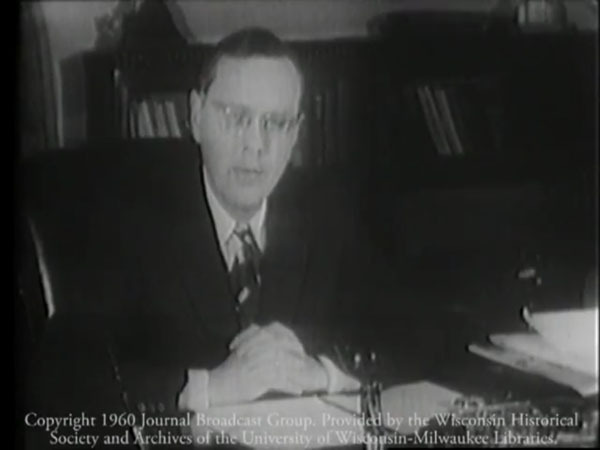 An interesting blog post from last month shows the WTMJ Newsfilm collection and several films on Mayor Zeidler from the early 1960s. A great segment that was broadcast in 1960 tells the story of all of the work the mayor does as part of his job and the employees that work under him. UWM Archives also has a Youtube channel which shows these videos and several others. The Milwaukee Journal Sentinel reported last week about the purchase of Civil War sketchbooks by the Wisconsin Historical Society. Bobby Tanzilo of OnMilwaukee.com found out about this book which was being sold by a dealer in Canada for over $10,000 and word must have got around to the Historical Society and they scraped together money to buy this one of a kind book for their collection. Henry Koch spent his time during the war preparing many maps under the command of Lt. Col. G. L. Gillespie. 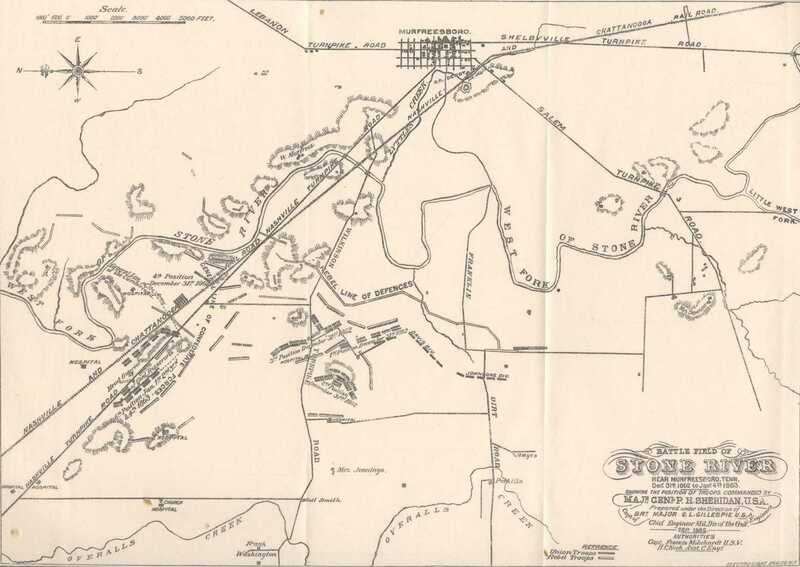 His job was as an Assistant Cartographic Engineer and he prepared very detailed maps of various battlefields which were used for the reports of General Sheridan. After the Civil War H.C. Koch returned to Milwaukee where he went on to become one of the city’s most famous architects. He designed the City Hall among many other well known buildings. 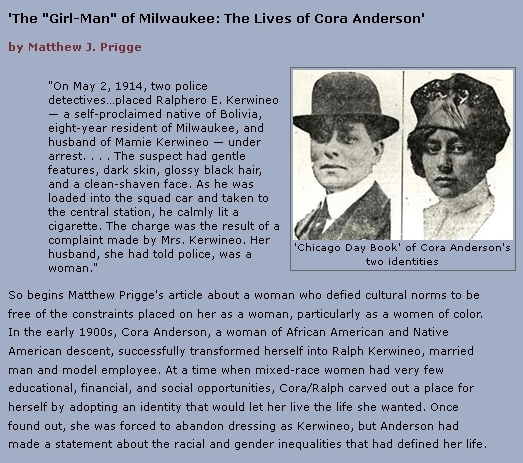 The Spring 2013 issue of Wisconsin Magazine of History has an article on the “Girl-Man of Milwaukee” written by Matthew Prigge. The article goes into great detail how Cora Anderson lived for several years as a man and even took a wife before being exposed by her friend to the authorities. Surprisingly this was not unique or even rare in the turn of the century Milwaukee. One of the earliest known examples was that of Frank Blunt. He was arrested in July 1893 on suspicion of theft of money in Fond du Lac. When he was taken to the station and about to be searched he suddenly demanded to be searched by a police matron where it was found that he was actually a she. Frank turned out to be Annie Morris from Nova Scotia who had run away from home at age 15. She decided to take on the disguise of a boy and through some misadventures was adopted by an itinerant horse trader by the name of Jesse Blunt. Jesse convinced her to take on the guise of a boy to pass as his son and that is the way it remained for the next 13 years. Jesse settled in Milwaukee and opened a saloon on the South side. Frank enjoyed the company of women and hung around gambling halls as many young men did in those days. After being caught, Annie was sentenced to a year in prison at Waupun for the theft. An interesting and final note to the story was the appearance at the trial of Miss Gertrude Field who claimed to have married Frank in Eau Claire and who helped to fund the defense for Annie. The most interesting story was that of Harry Hynes who was discovered in 1899. Police had noticed a young woman who looked strange walking downtown streets with a shabby dress, glasses, and wearing rouge. When the police finally had a chance to stop and question “Harriet Brown” in front of the Alhambra Theater they found out she was actually a 17-year old young man. The tell tale giveaway that the police noticed was the five-o-clock shadow on Harriet’s face. Otherwise, he had the practiced air of a woman’s mannerisms, wore a wig, and was found to have several dresses at his rooming house. Harry worked vaudeville theaters as a female impersonator and even managed to find part time work as a servant girl at a home on 8th & St. Paul a few weeks prior to being arrested. During questioning he explained that after his mother died two years ago he had been unable to find work as a man and had donned the attire to find other work as a woman. He ended up serving 60 days for disorderly conduct in the House of Correction and disappeared after his release, possibly to Chicago where he supposedly had relatives. 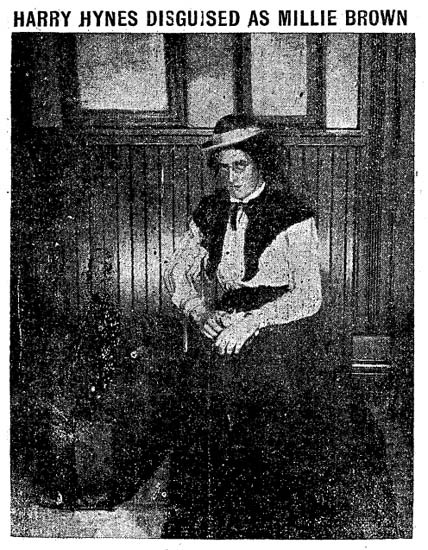 Another story very similar to that of Cora Anderson and happening virtually at the same time was that of Jessie McNeil. The 24-year old woman was discovered by police in July 1915 in men’s clothing, and with a short hair cut at 4th and Juneau. She was with Emma Jacobs, 33, an african-american woman who was living as her wife at a colored rooming house at 7th & Winnebago. Jessie told police that she dressed as a man to earn higher wages and that her parents in West Allis knew of her lifestyle. As a woman she could only work at jobs that paid $4 a week but as a man she was working at jobs paying $10 and $14 a week. Jessie was living and working in Chicago as a man but was caught by the police there and told to leave the city in early 1915. Afterwards she came to Milwaukee, met Emma and lived with her as a roommate for three months. In 1911 a group of buildings was built on 206 acres of land to house the Milwaukee County School of Agriculture. 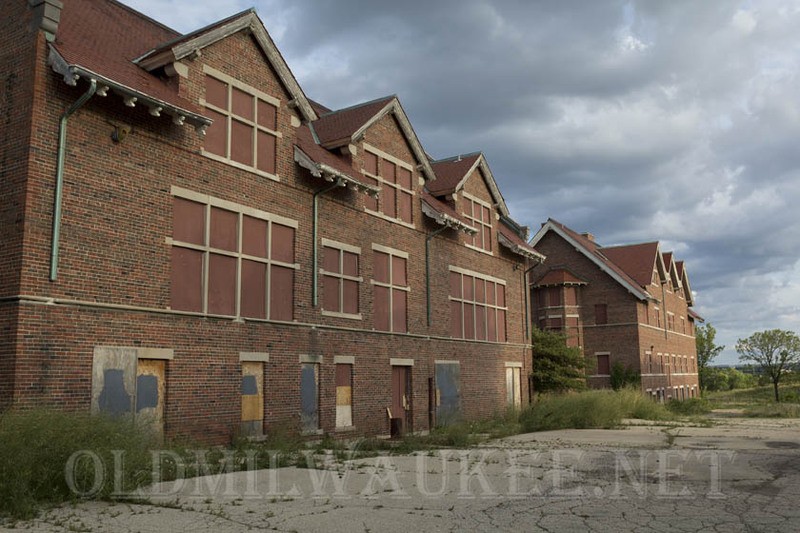 These are now known as the “Eschweiler Buildings” and are part of a controversy about saving solid historic buildings to incorporate them in the UWM Foundation’s Innovation Campus. The School of Agriculture lasted from 1912 until 1928 when development in the county was encroaching on much of its farmland. There were also arguments about the waste of resources in running such a school from the very start. A report was written by the Taxpayer’s League in 1916 which highlighted inefficiencies and failings of the school. But there was still enough good press and good intentions to keep it running after that report was released. The following article was written in the Milwaukee Journal of May 3, 1925 and tells many details about the school to try and keep a high enrollment. It was a unique institution across the state and its likes could be very useful to build an interest in self-sufficiency even today. The buildings have a county landmark designation from 1978. Instruction in agriculture and domestic economy without tuition cost to residents of the county is provided for by the Milwaukee County School of Agriculture and Domestic Economy, maintained by Milwaukee County. Four large and well equipped buildings are located about a mile and a half west of the city of Wauwatosa, adjacent to other county institutions. The school farm includes nearly 1,100 acres; the largest secondary school farm in the United States. This land is used to demonstrate to students the solution of practical farm problems. Eighty-five acres are devoted to fruit growing and truck farming. Eight greenhouses are used. There are six dairy barns, the school owning a dairy herd of about 250 head of cattle of the leading dairy breeds. The swine herd numbers 400 pigs, a small flock a pure bred Hampshire sheep is kept in large flocks of poultry of the leading varieties. Thirty-eight horses are used. Four-year and two-year courses in agriculture are given, a one year course for high school graduates and a short course during the winter. Four-year and two-year courses in domestic economy are given. The courses in agriculture include animal husbandry, agronomy, entomology, poultry and academic work similar to that in regular high schools. The domestic economy course includes sewing, cooking and food study, physiology and personal hygiene, drawing and house planning, laundering, dietetics and meal planning, millinery and art needlework, child welfare and home nursing, household management, textiles, selection of dress, home decoration and furnishing. The school also is headquarters for boy and girl club work in Milwaukee County and holds many conferences, institutes and meetings of farmers and different organizations interested in agricultural work. The faculty of 12 members is headed by T. H. Campion, superintendent.